How to make rocket launches possible has advanced to a more recent question: How to make frequent rocket launches safely. Researchers in Japan have developed a solid rocket fuel manufacturing method that should interest scientists looking into such methods. The Japanese researchers' approach is based on the peristaltic movement of the colon using "soft actuation technology." Digital Trends' Luke Dormehl called the team's approach a "robot intestine" sending out "perfectly mixed rocket fuel." The technique involves both mixing and conveying the materials. The title of their paper is "The Continuous Mixing Process of Composite Solid Propellant Slurry by an Artificial Muscle Actuator." Author affiliations include the Graduate University for Advanced Studies, Nihon University, Chuo University and JAXA (Japan Aerospace Exploration Agency). IEEE Spectrum said the fuel is being developed in Japan by Chuo University and JAXA roboticists. Mixing solid propellant slurry is one of the stages in the solid rocket manufacturing process. "Solid propellant slurry is produced by mixing oxidizer powder, metallic fuel powder, prepolymer and additives," said the authors. The "goo" seen in posted videos is "ammonium perchlorate powder, aluminum powder, and an elastomer binder that's composed of hydroxyl-terminated polybutadiene (HTPB)," said Dormehl. NASA's 2016 note on fuel ingredients: "Solid rocket fuel is the original rocket fuel, dating back to the early fireworks developed by the Chinese centuries ago. For the SLS boosters, aluminum powder serves as the fuel and a mineral salt, ammonium perchlorate, is the oxidizer. the blog added that "When it burns, oxygen from the ammonium perchlorate combines with aluminum to produce aluminum oxide, aluminum chloride, water vapor and nitrogen gas – and lots of energy." 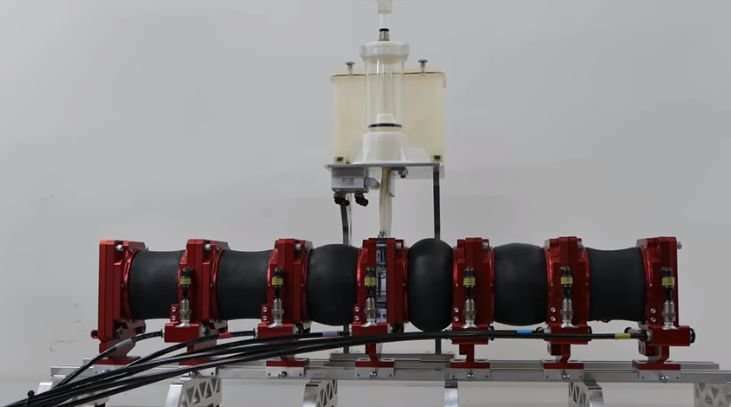 Vincent said the prototype apparatus designed by engineers to mix the fuel was "basically a series of connected segments of tube that compress back and forth like a worm. This motion mimics how our intestines and esophagus move food around our body—a process known as peristalsis." The authors wrote, "In this work, we develop a peristaltic continuous mixer that is safe and provides well-mixed propellants." They said the pump was modeled on two peristaltic motions of the intestines, segmental movement and pendulum movement. The outside part of this mixer is made from an artificial muscle, and the inside part is a cylindrical tube. Dormehl described a tube-like system closed off at both ends, with material added in the middle, alongside pressurized air. As the tubing contracts and expands, the mixing process is carried out, with the end result being the expelling of rocket fuel." After that, the fuel can be cured "to turn it into a rubbery solid." They propose turning the fuel manufacturing process into a continuous pumping process. Their way is thought to be safer than conventional mixers. How is it safer? Evan Ackerman in IEEE Spectrum: "The researchers say their machine is safer ... because the fuel doesn't experience high shear stress inside the undulating rubber tubing and is never in contact with metal, avoiding the risk of fire and explosions." Eric Limer made a similar point in Popular Mechanics. "Traditional mixing processes, which are more aggressive and tumultuous, are functional but potentially dangerous because they both churn the highly combustible fuel against itself vigorously but also bring the substance into contact with the metal container it is being mixed in." Limer said, "Put into production, the mixing system would likely be a long, closed chain of such robots, pumping the mixture back and forth among themselves." It looks overly complicated. The same effect can be had by a single rotating camshaft that has grooves or flanges that move the intermediate rings between the rubber parts. A similiar mixing effect can be made with a descending trough with maze-like baffles inside, and the whole thing is slowly tipped left-right-left to let the material mix as it flows down the chute.